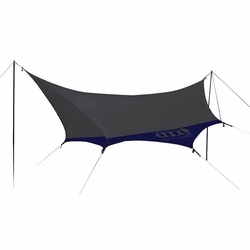 ENO Super Fly Utility Tarp. Without the SuperFly, basecamp just becomes a couple of tents in the middle of nowhere. It's big enough to host a rainy day Hold 'Em tournament or a stinky campers potluck, and features two poles to give you plenty of clearance. Comes with included stuff sack. Eagles Nest Outfitters.